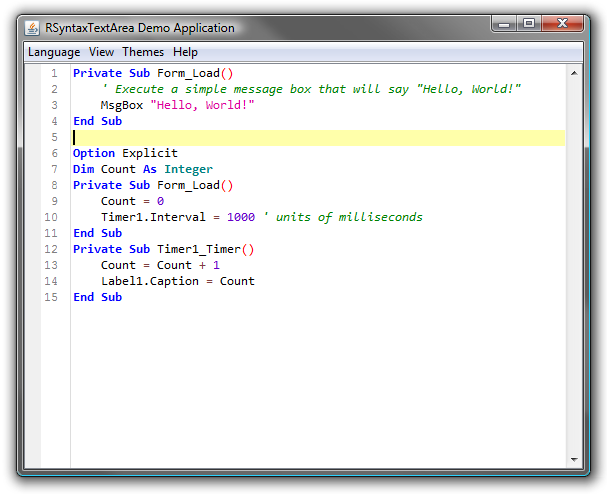 Syntax highlighting for Visual Basic was just added into SVN. I probably won’t bother with code folding support for VB any time soon, since I don’t ever write code in it, but if you’re itching to contribute, I’m always willing to take patches! 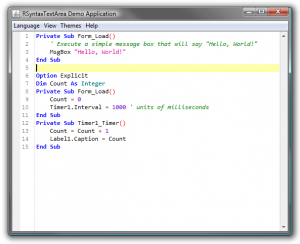 This entry was posted on Sunday, March 31st, 2013 at 10:28 pm	and is filed under RSyntaxTextArea. You can follow any responses to this entry through the RSS 2.0 feed. Both comments and pings are currently closed.